The city’s new iconic landmark, Dubai Frame, will be ready for visitors SOON. Since construction started at the end of 2013, the Dh160 million project is now close to completion. 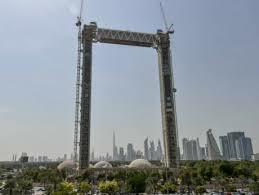 The Dubai Frame project consists of two 150 meter towers 9 3 meters wide, connected with a 100 square meter bridge where ample room will be available for visitors to take snapshots of the city’s panoramic view. A cafe will also be available at the top. The bridge was initially set to be completely made out of glass but, after careful consideration, it was decided to install a 25 square meter glass panel in the middle of it instead. Some people may be afraid to look down, and we wanted to make this iconic building an enjoyable experience for all. Construction work on the iconic Dubai Frame project adjacent to the Stargate theme park in Zabeel Park, Dubai, is ongoing. The project is located near the Star Gate games and rides area of Zabeel Park and, according to municipal documents, the tower’s mass was recorded at a staggering 23,453 tones. The site for the landmark tourist and leisure attraction was chosen after extensive surveys of what location would offer the best views of new Dubai and old Dubai through the frame. The Project is at the final phase of cladding the building, and an external cladding cleaning mechanism will be incorporated in the design by consultants. the panoramic lift will be fixed and the museum will also be set up. The project is expected to attract 2 million visitors a year. 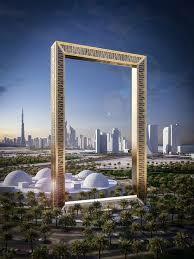 Dubai Frame to be finished in 2016. It is predicted that it will become a major tourist destination in the city – one of the buildings, like the Burj Khalifa and the Burj Al Arab, that all visitors to Dubai will feel they need to see.